Back in the day, when it was acceptable to build walls, many eastern cultures went all the way in protecting their kingdoms. The most noteworthy of them all, without a doubt, would have to be the Great Wall of China. 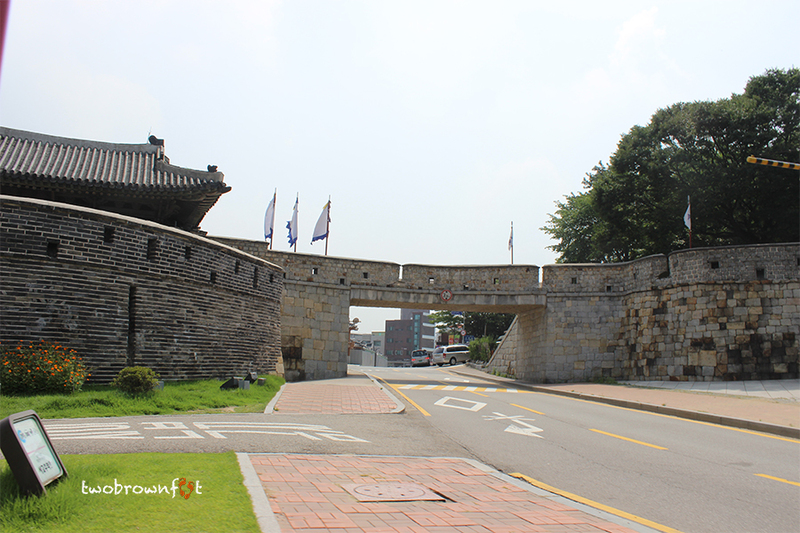 However, still unknown to many travellers; Korea has its fair share of city walls. 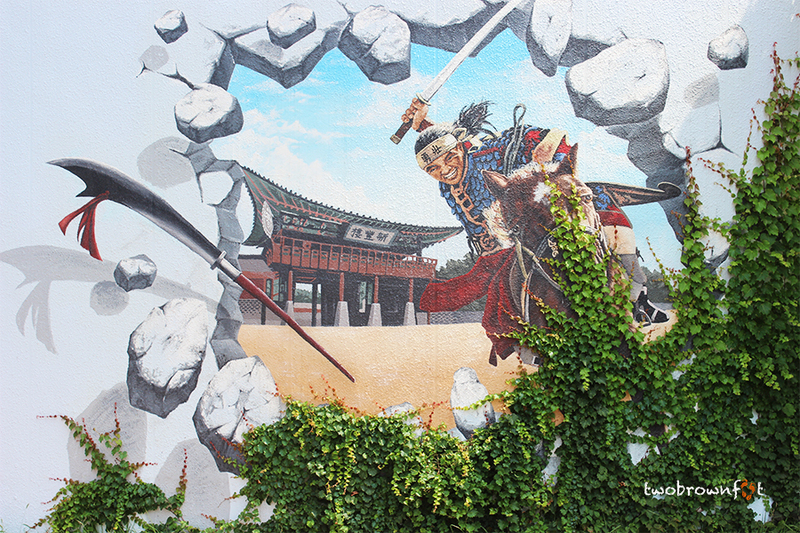 The ancient capital, Seoul, was surrounded by a wall — running through — its 4 guardian mountains. Remnants of the wall are acessible by easy hikes, along these mountain trails. 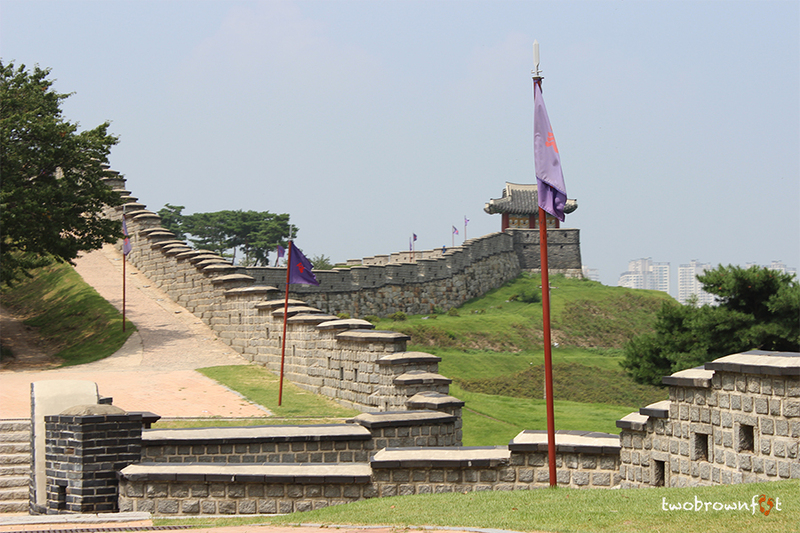 And like Seoul, Suwon’s top draw, is its UNESCO World Heritage Hwaseong Fortress. The length of the city wall runs across 5.74 km. On a rather hot weekend, in the first week of August, we chose to visit this laid-back town. The best part of the Seoul Subway, is that everything is within easy reach. 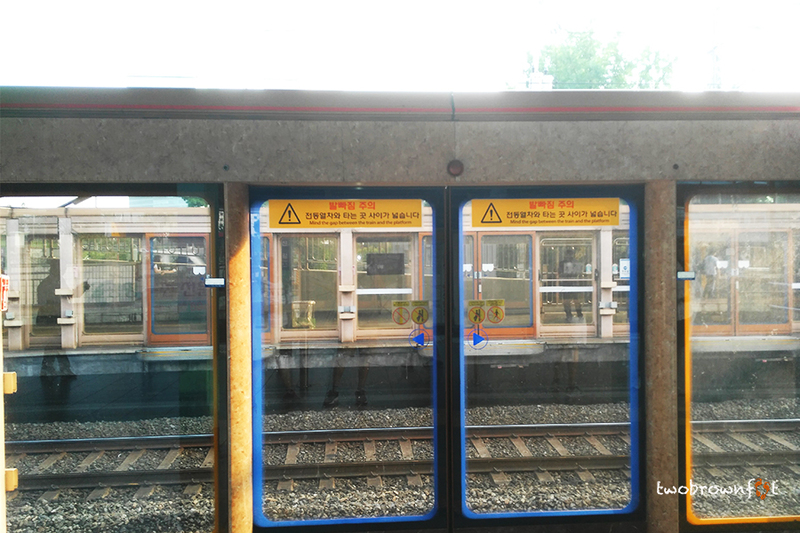 Suwon can be easily reached, within an hour, by taking Line 1 (change at Singil) on the Seoul Metro. 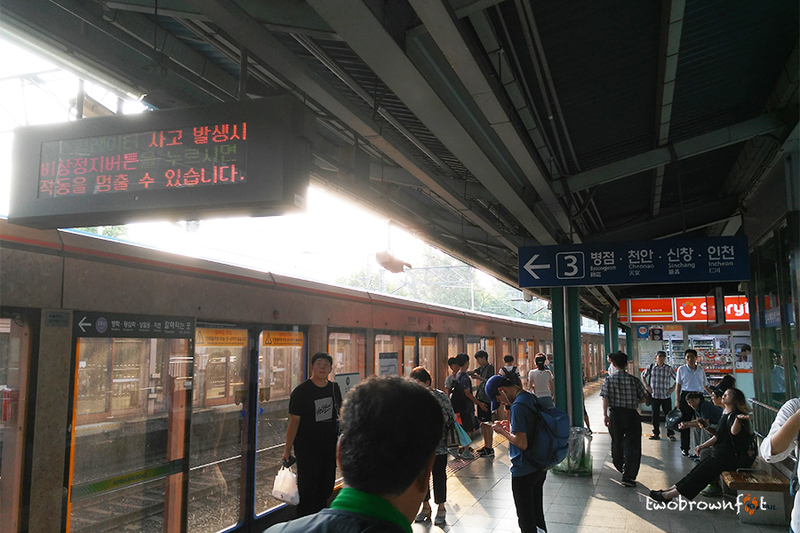 With some trains heading towards Incheon, it’s best to pay attention to the announcements, and read the information boards. The local tourism office (exit 4), is the best place to get the right information on the town. It doesn’t open before 10 am, so we had to wait for 15 odd minutes. 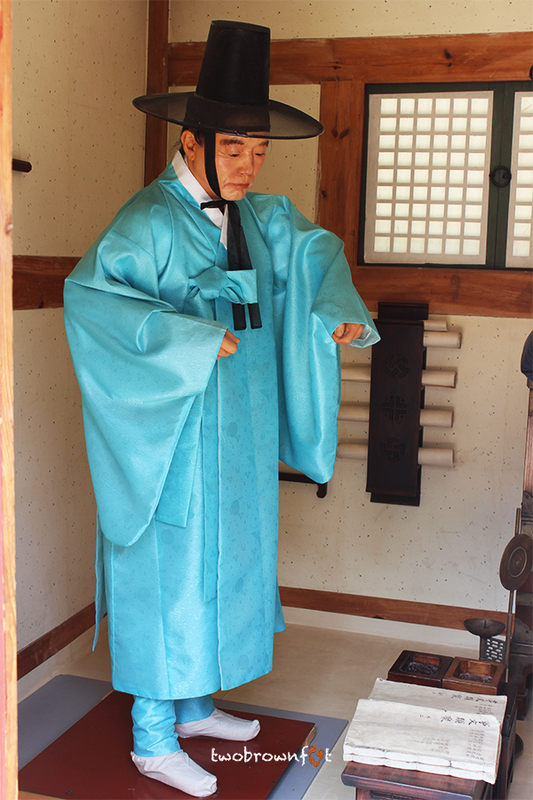 On a sweltering day, even the elderly Korean guide, found it hard to stop the beads of perspiration from falling down. We picked up a tourist map of the city and planned a basic itinerary — keeping the temperatures in mind. With our hotel check-in scheduled for 3 pm, we had a good couple of hours to explore the major tourist sights of the city. The main bus stop was packed with local tourists. The key to finding the right bus is to coordinate the number of the bus (written on the main information board) with the corresponding shelter. Fortunately, quite a few buses head towards Paldalmun Gate (also known for two famous local markets) and it didn’t take us long, to hop on a bus with empty seats. Our T-Money cards came handy and it’s a good investment, if you plan on spending a week visiting Seoul and its neighbouring cities. These cute cards can be used on subways, local buses, and even in select convenience stores. 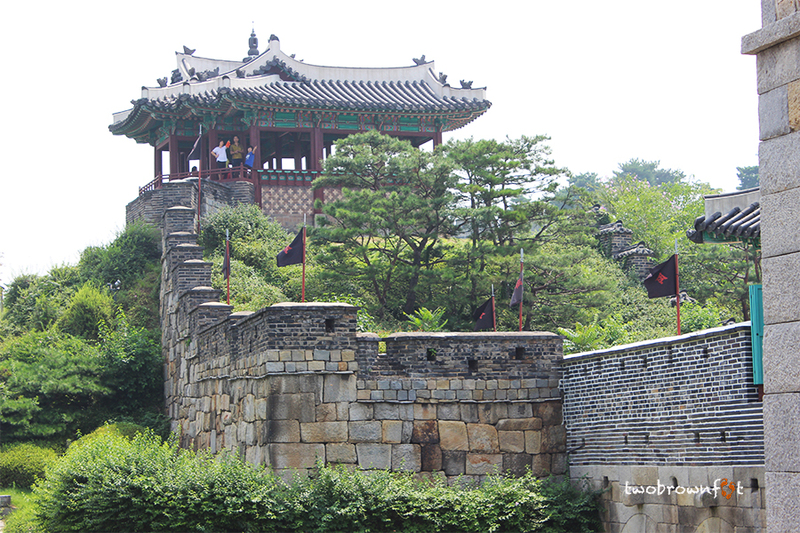 Paldalmun is the southern gate of Hwaseong Palace. It’s not very hard to see how it gets its name (intersection of roads), when you stop to admire this old gem — stuck in the midst — of whirring traffic around. I’ve always been mesmerised by old gates like these. It’s as if, the world around, moved forward into the next century, and these imposting structures of stone, got left behind in time. I wish I could have spent more time ruminating and admiring what I saw before us, but the heat made it impossible to think. We head in the wrong direction, towards Paldalmun and Jidong market. 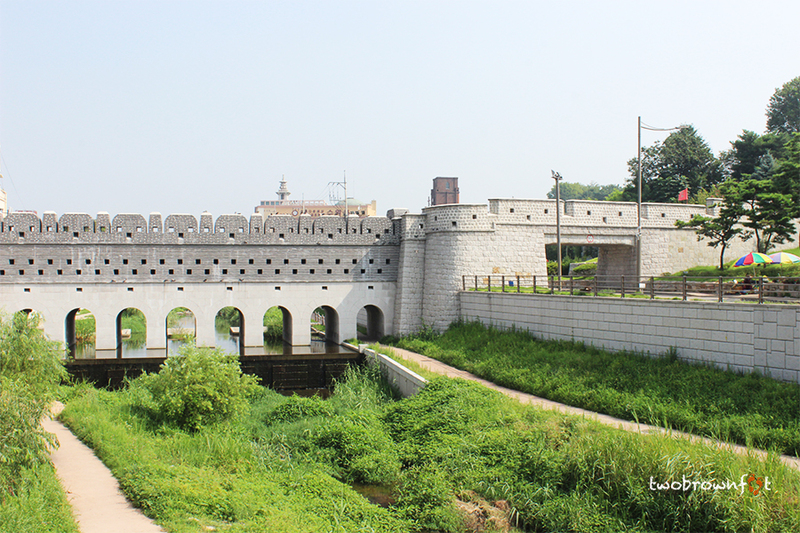 We saw a section of the wall, connecting the Namsumun Gate (South floodgate) with the last pavilion on the eastern side of the wall. It’s also possible to walk the wall, along this section, but we had set our hearts on hiking the mountain side (western section) of the wall. After wandering around in circles, we finally reached the right entry, towards the next tourist information centre and also the first point, in our walking course, for the day. As we inched towards the centre, the wall made an appearance, through the dense thicket of green trees. 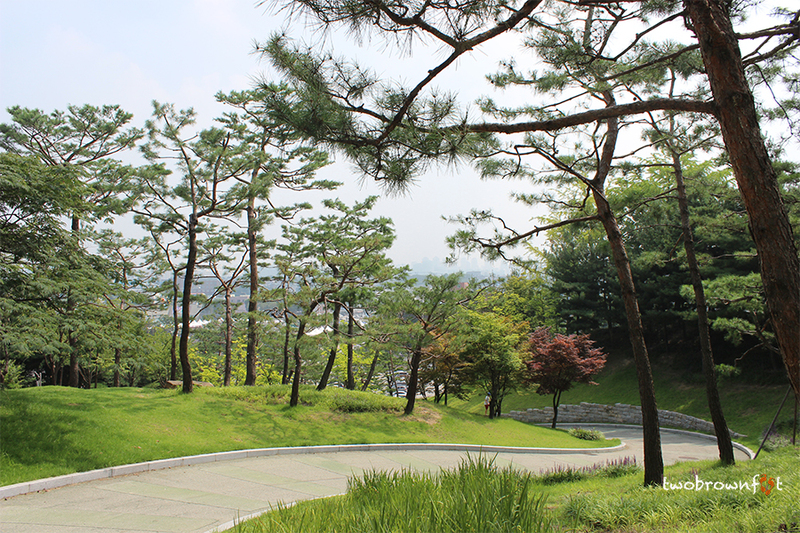 It was tempting to head straight up, but we followed the path, prescribed at the tourism centre, and bought a combined ticket to the Hwaseong Haenggung Palace and couple of other museums (which we eventually didn’t visit). As we made our way through the narrow alleys of Gongbang Street, lined on either side, by clay works and artist studios; I found it hard to stay focussed on the empty lane ahead. Most of the shops were shut, but I could imagine what the inside of many of these studios would look like. Even, the walls of buildings were plastered with street art or tiles. I temporarily forgot about the heat and how frustrated I felt. 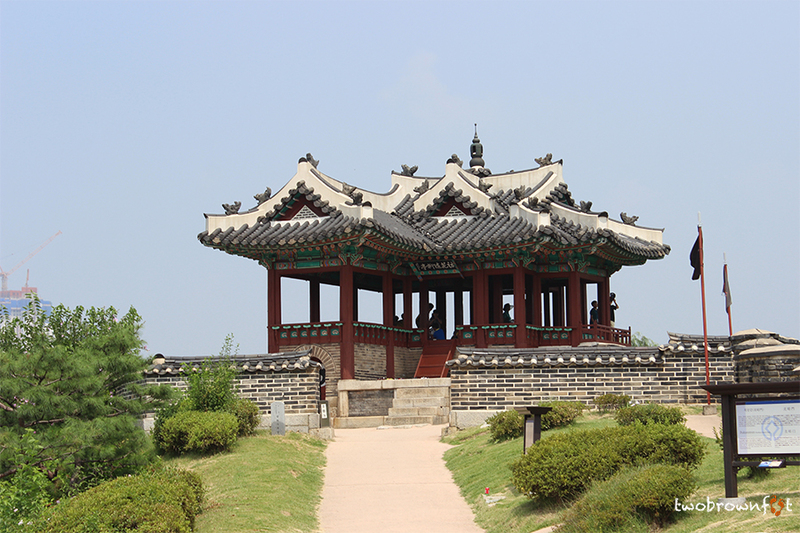 During a war, the royal family would retreat to a temporary palace, also known, as haenggung. 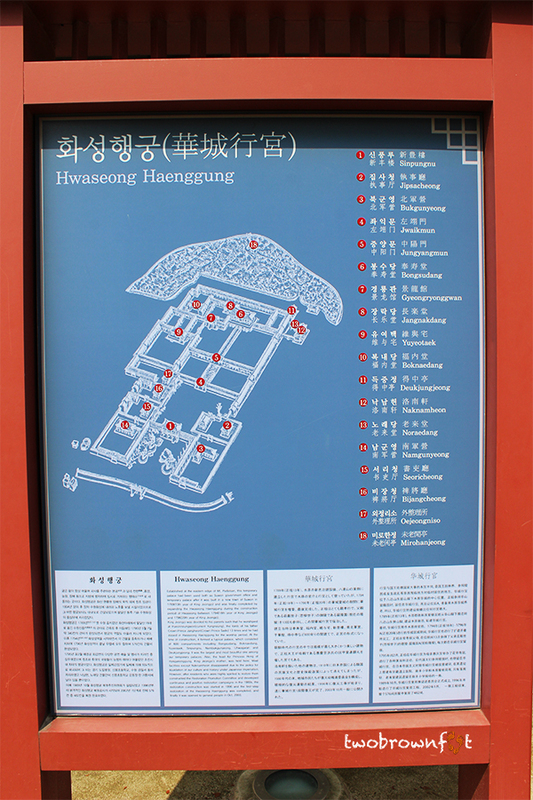 Hwaseong was particularly important, as it is the largest among all the other temporary palaces, used by the Joseon Kings. The grounds, outside the Palace gates, were being prepared for a night celebratory concert. 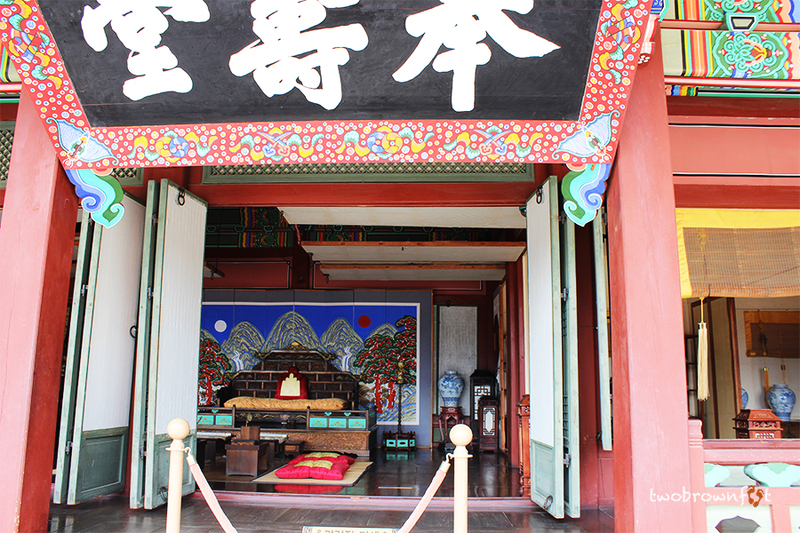 We entered the main gates of the Hwaseong Haenggung Palace and walked towards the inner chambers. What I find unsettling, about most Korean Palaces, is how deserted they seem to be. Built with wood, tiled rooftops with a line of animals, and an occasional splash of colour, the palace lacked the opulence or grandeur of what a palace is believed to be. 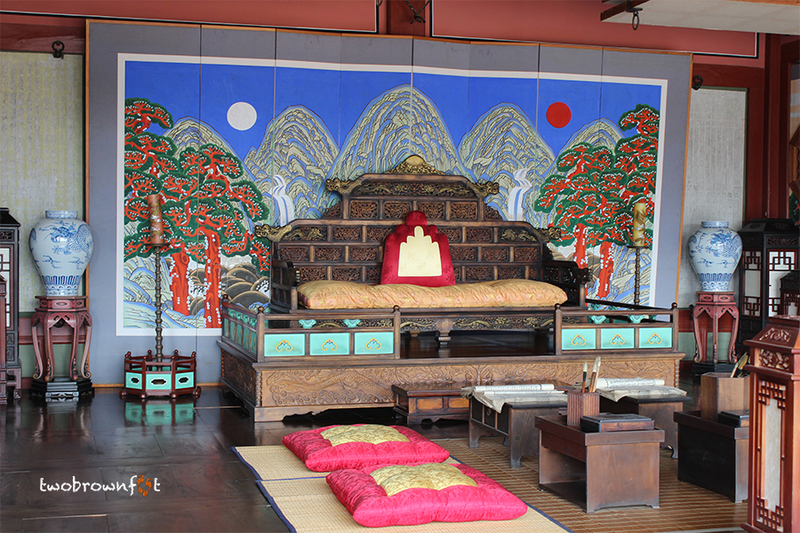 And yet, it’s worth a visit, to get a taste of the life of the Joseon Dynasty Kings. 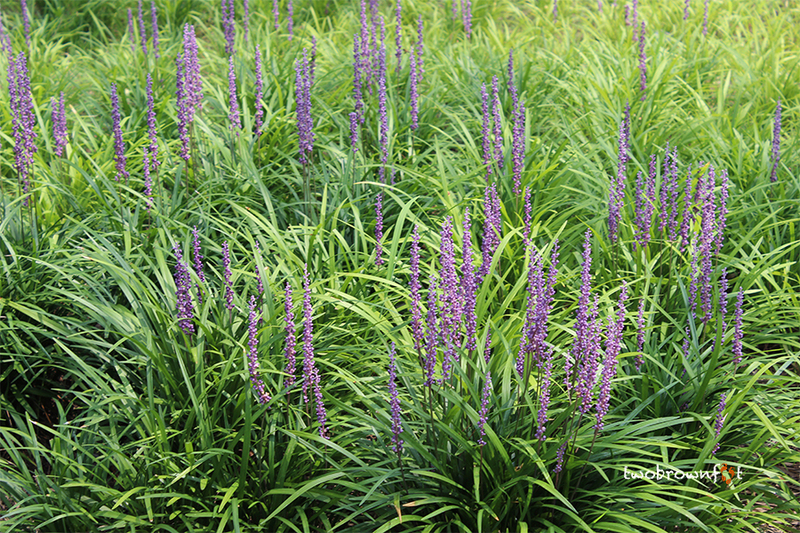 Although, at that moment, I wished for less open space, as I could feel my skin caramelise in the afternoon sun. 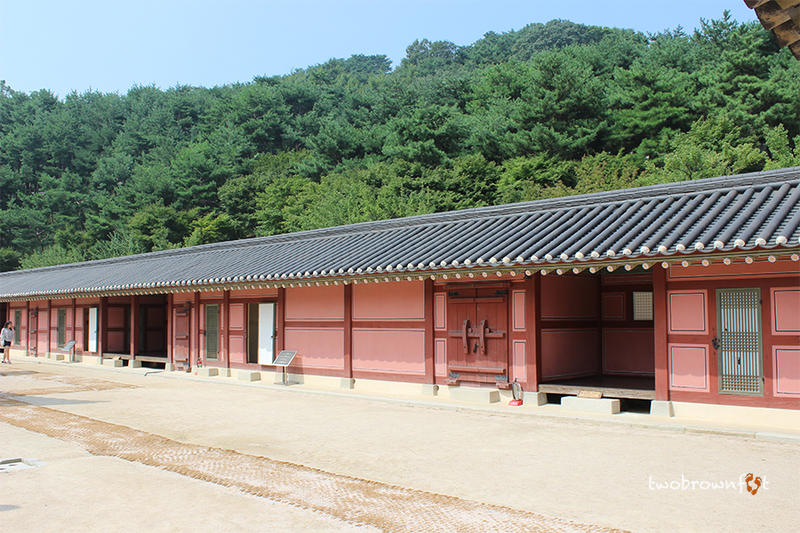 Bongsudang was one of the most important chambers of the temporary palace, as it was the preferred area for King Jeongjo to stay, during his visits. The highlight of this particular palace happens to be the celebration of the Queen Mother’s 60th birthday, also coinciding with King Jeongjo’s abdication. The last section of the palace housed the chambers of the queen and eunuchs. The heat took a toll on Basil and he didn’t seem happy to walk around. So we took a short break under the shelter of a tourist shop. After clicking some pictures with the Trick Eye murals, we head for the wall (parking lot). It was nearing noon and the heat was pretty unbearable. So, as we walked uphill to reach the wall, we felt drained out and I could feel the heat sap my energy. 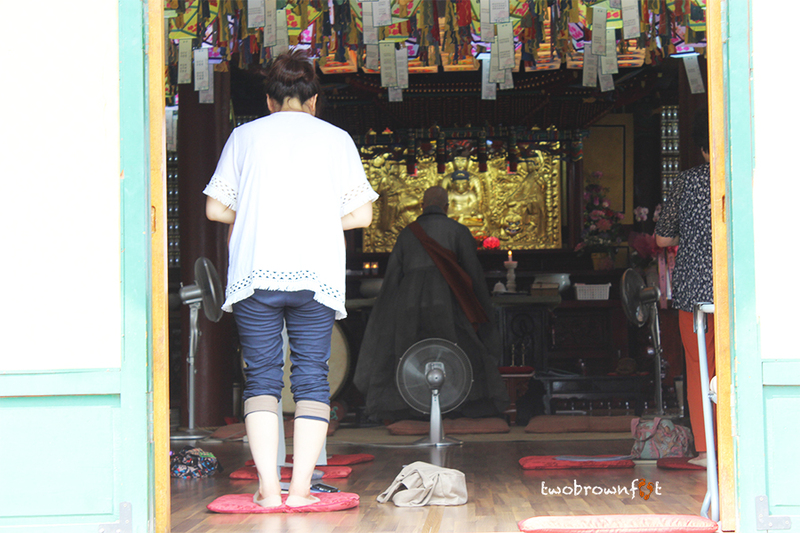 We took a small detour at Daeseungwon Temple. Monks were in the midst of chants and prayers. 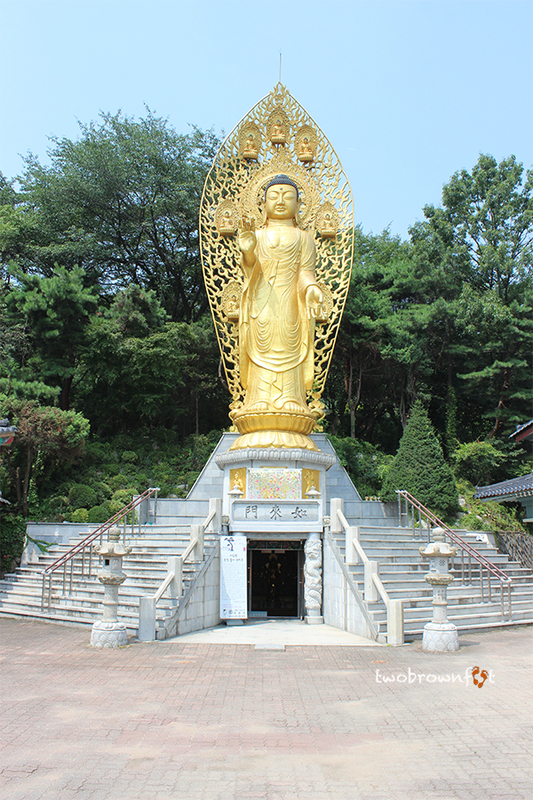 A towering statue of Buddha shimmered in the afternoon sun. There didn’t seem to be another route on the other side of the shrine, so we returned to the main path and walked upwards. I’d have to sheepishly admit, that we gave up, the minute, we saw the trolley platform. It was too hot to continue walking. And we didn’t have a clue, how much longer, it would take to walk the wall. So, we rushed and bought tickets to the toy train and were the last to be seated. I can’t remember, the last time, when I sat on a similar train. Kids waved at us and the guy standing on the rear end of the train, was kind enough, to tell us to take pictures at the right moment. It’s a different matter, that it’s not always possible to get the right shot, whilst you’re moving in a train. 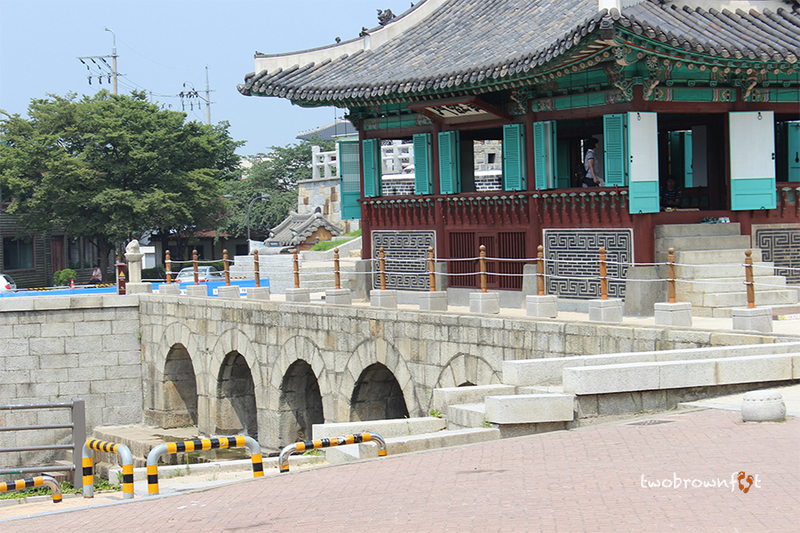 We missed King Jeongjo’s Grand Statue and got a passing glimpse of Hwaseomun Gate. 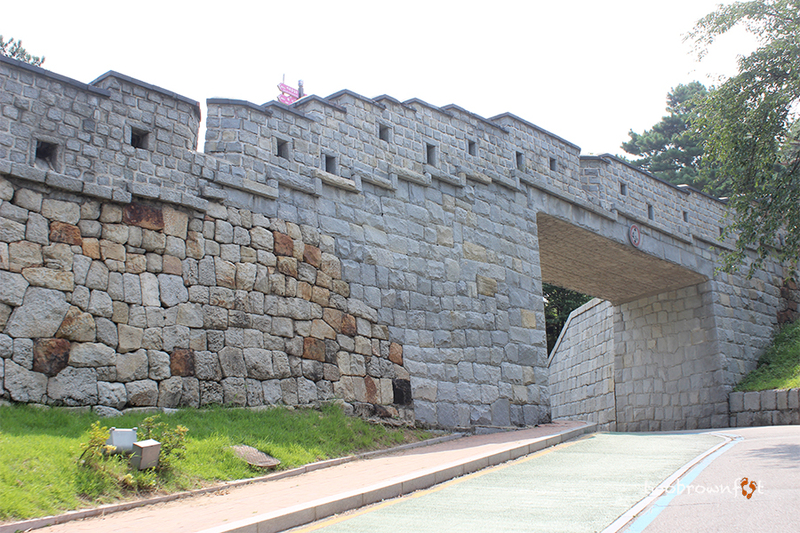 In our little train adventure, we rushed by Janganmum Gate (the north gate of Hwaseong) representing the stability of the citizens of the area. 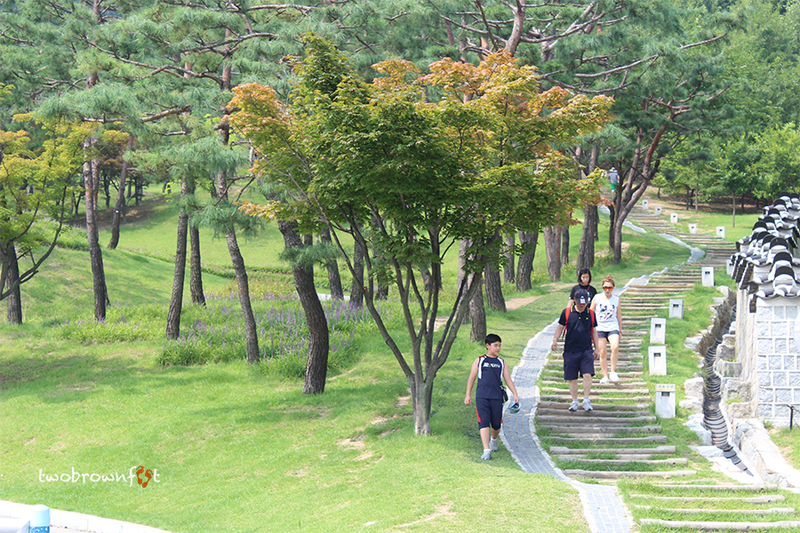 The gate was destroyed during the Korean War, but was subsequently restored. On the outer side of the wall, our train doubled up as a tram, and we whizzed by pretty quickly. Pavilions, sentry posts, guard bastions quickly passed by. We went around the aqueduct, surrounded by bright blossoms, and Basil managed to capture the Hwahongmun Gate (second picture above). And finally, our fun ride came to an end, at the Traditional Archery Ground. Previous articlePhotographyBeam Me Up, Scotty! Such a fascinating and colorful place Cheryl. Your posts always manage to intrigue and take me out of the ordinary. And despite the heat it sounds as though you managed to see quite a lot in the day. We did lot more on that day. I had to break the post into 3 parts. 🙂 The heat didn’t really stop us! Aw! We’re pretty normal, probably boring, if you’d ever meet us. Travel makes us feel super! 🙂 Thanks for making my day, Miriam. Me too! And might I add, thanks to so many wonderful Aussie bloggers (like yourself) I’ve added Australia to our bucket-list! haha! I’d love to meet you as well! Thanks a bunch, Sue! Many times, structures like the wall or even palaces take me back to China. 🙂 There’s so much similarity, if one looks closely. Wow..thank you for taking us along in this wonderful journey. your photos really describe this place. Looks really fascinating. The landscape and the rich history behind it makes it even more worthy of visit. Thanks so much for your comment, Christina. 🙂 Basil did a pretty good job with the camera — despite the heat. 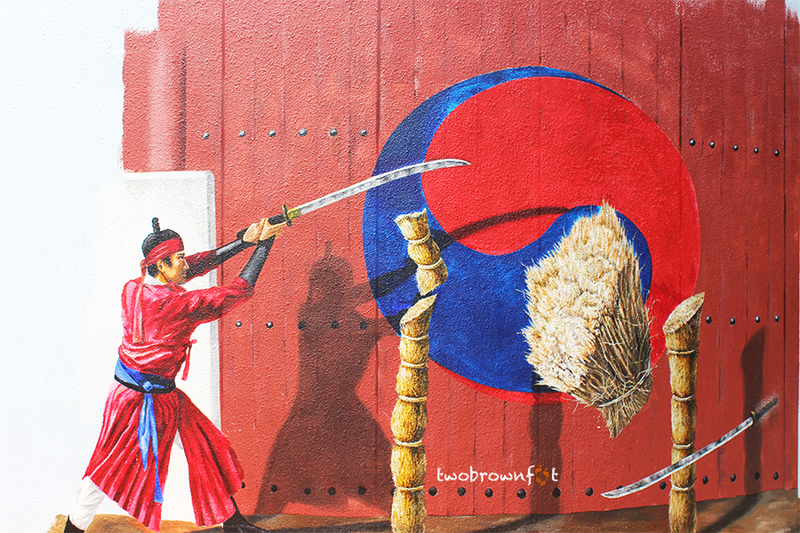 Korea is dotted with nuggets of history. In the middle of modernity, you’d find a gem. 🙂 Makes travelling/living all the more interesting. In spite of having visited many walled cities around the world, I never consciously made the comparison between those walls that seem so charming and historically interesting now, and the walls some people want to build today to keep others out – even though both have similar origins! Thanks for the connection. Strangely, I never made the connection until we visited Suwon. And I felt what a world of difference walls can be/signify, depending upon, which half of the hourglass — you choose to look from. Thank you for this beautiful & colourful walk Cheryl! I agree heat can be painful at times but you managed to explore quite a bit!!! Loved all the pics too…especially the paladalmun…the structure is amazing! I am so happy to have been able to enjoy all this beauty from the comfort of a boat under sail (with lots of breeze) rather than the extreme heat in which you braved it. Given all this magnificence, I have now added Seoul to my list of must visit places. Thank you for giving me such a wonderful tour of the walls, the temples, the greenery, and the really cool street art! It is quite fascinating. 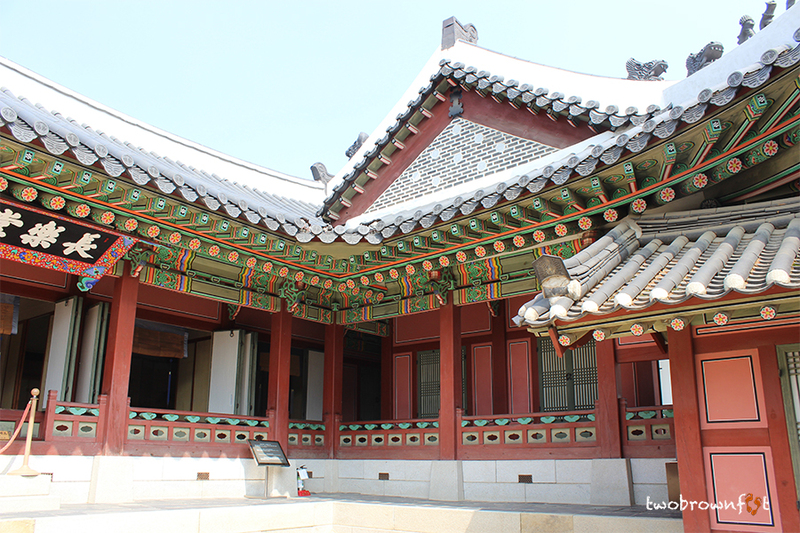 Although Gyeongbokgung Palace(in Seoul) is far more interesting. I remember sitting next this exhibit, to make the most of the shade of the roof above. 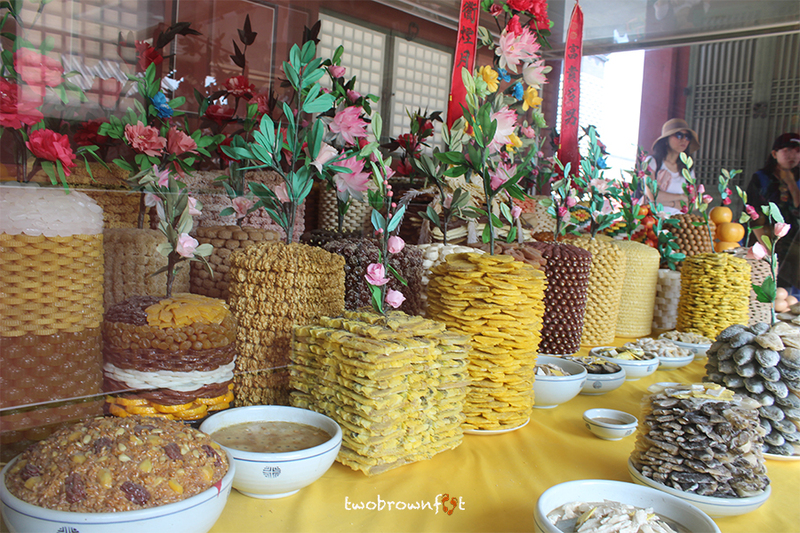 A Japanese guide ignored the heat and animatedly explained the details of this feast to her curious guests. All I could wonder was how could they pay attention to any of it, when the heat was sapping our energy away. I’d never seen Basil so irritable before. And at the end of the walk (next post) he got a bad headache. Interesting. May be it wasn’t the weather but something invisible that took away your energy. You never know. These places are ancient, full of unknown. Haha! 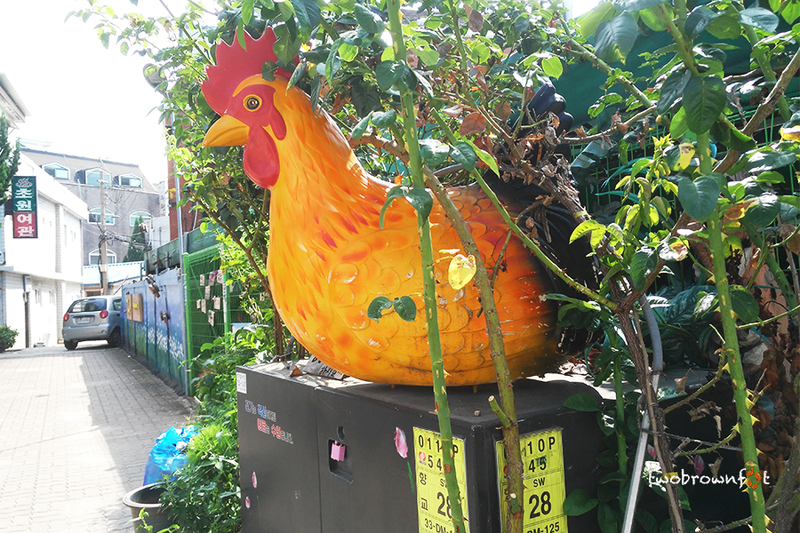 I was getting cooped up in Seoul. 🙂 The heat wave was really bad! Worse than last year (my first trip to seoul). I read the government had ordered restaurants and stores to close all doors during operational hours, in a bid to curb electricity prices. Didn’t hear anything about the discount! 😦 We got a pretty fat bill ourselves!